The kitchen is the heart of many homes. It’s a gathering place for meal preparation, for spirited conversations, and, if you’re like me, the best place to find a decent cup of coffee. The kitchen brings people together, and also helps us gain the energy necessary to make it through the day. The obvious high utility items in the kitchen are the oven, stove top, refrigerator, and sink. After these workhorses come pots and pans, plates, drinking vessels, and silverware. If someone in your life needs any of these items to be replaced, I recommend getting his opinion on the matter. People have such strong personal preferences on these items, not getting the gift recipient’s input can end up wasting time and money for both of you. The next segment of high utility kitchen items includes knives. If someone on your list is using damaged knives, her safety is at risk every day. Replacing these knives can greatly improve the quality of her life. The knives, sheath, and block (pictured below) are mostly inexpensive and the whole set can be combined for under $315.00. And, since it’s à la carte, you would only need to purchase the knives your gift recipient needs. If all your gift recipient needs are his knives sharpened, this might be a good present, too. Where I live, the average price to have a blade professionally sharpened is $1 per inch of blade. To sharpen a 10-inch chef’s knife would cost $10 for that knife. National chain kitchen stores like Sur La Table often provide this service, but it is also a good idea to check Angie’s List to see if there is a respected professional knife sharpener in your area. The daring individual on your list might be up for the AccuSharp Knife Sharpener (not pictured below), which is available on Amazon for less than $9, to sharpen her own knives. 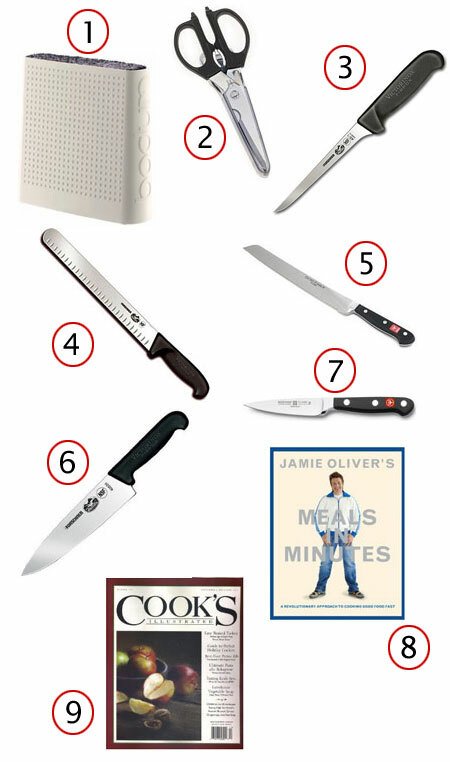 If knives aren’t an issue, but getting food on the table every night is stressful, consider (image 8 ) Jamie Oliver’s Meals in Minutes cookbook. 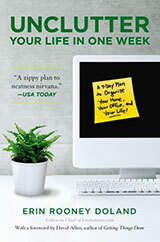 He does a wonderful job in this book discussing ways to set up meal plans for healthful and easy meals. Our family relies on many of these types of cookbooks to help us get food on the table without anxiety or arguments. As part of our 2011 Gift Giving Guide, we also will have a special offer for The Six O’Clock Scramble meal planning and recipe service. 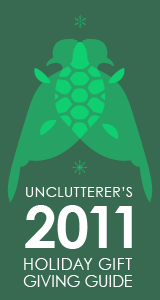 In December we’ll provide all the details for how to get an Unclutterer discount when you purchase for someone on your list or as a gift for yourself. If the person on your list already seems to have everything useful in the kitchen and isn’t stressed out about what to get on the table, a coupon from you to help him unclutter his cabinets or deep-clean his refrigerator might be a welcome (and free) gift. Obviously, such an offer isn’t perfect for everyone and must be given delicately, so as not to be taken as an insult. I know that immediately after becoming a mother, an offer like this would have been highly treasured. Please add your suggestions for daily use kitchen gifts in the comments. 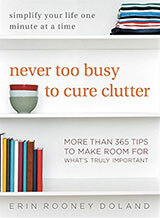 The more ideas we can collect the more we can help someone looking for an uncluttered gift. @Kate — Classes are a fantastic idea! A good class will teach skills that can be utilized every day in the kitchen. That is high utility in my book!! I will vouch for the awesomeness that are the Victorinox knives. The price is reasonable, and the blades are wonderfully sharp and stay that way with minimal effort. Just be very careful when washing them… we’ve accidentally sliced up a few kitchen towels and dish cloths with them. They are that sharp! This isn’t exactly an uncluttery idea but when giving knives or scissors, a lot of people hold the superstition that it is bad luck to do so or that doing so will sever the friendship/relationship. Different cultures hold that the recipient should pay the giver soemthing (a nickel, etc.). Others hold that the gifter should include a small financial token. Still others would go buy the knives, but give the recipient the cash equivalient and allow the recipient to “buy” the knives from them using that cash. Are kitchen shears a unitasker? What do you do with them? I don’t own any so I don’t know what I’m missing. What other good options are there for knife storage? @Steve — Yesterday I used mine to cut the spine out of a whole chicken before roasting (and yes, I wash them after every time they touch food), open the awful plastic packaging on a gift I was wrapping for my son, cut up a paper sack to be used as wrapping paper, cut a piece of parchment paper into a square to make a roasted vegetable pouch, cut up some fresh basil for pasta, and cut open the blister pack of my allergy medicine. Most everything I’ve just listed can be done with another tool, but the kitchen shears make fast work of whatever they do. Many families have two sets — one just for food and one for utility uses — but we just have one and wash and rinse them many times over the course of the day. As a foodie, I would always appreciate a gift of really nice olive oil or fancy vinegar or other ingredients to cook with. Or a small gift certificate to a local gourmet store where I can buy artisan cheese or something that I wouldn’t ordinarily get for myself. I’d also appreciate some nice dish soap or other cleaning product (CALDREA or MRS MEYERS) that I wouldn’t normally buy for myself. I actually prefer the Kapoosh universal knife block to the Bodum. The wood frame works better in my kitchen and I like that it’s angled because my cabinets are low. It’s also cheaper, I believe. I would probably take the safe route and give a gift card for Williams-Sonoma or Sur la Table if I were gifting someone who I knew was setting up (or renovating) their kitchen. It’s what I would want myself as a “kitchen” gift, unless it was coming from someone who eats with me very frequently indeed and knows how I cook. Kitchen gear and preferences really are extremely personal. I don’t like having any knives or cooking utensils out on the counter, for example – so a countertop knife block of any kind would be wasted on me; mine live in a drawer. That said, an excellent knife or pair of shears would most certainly not be wasted on me or, I suspect, on any of my friends who cook. Interesting about the superstition … never heard of that one! @chacha1, I keep my knives on a magnetic bar. I agree that I dislike the clutter of a knife block. I was trying to figure out this season’s gift image. Two birds and a pinecone? No, that wasn’t right. Two birds and a grenade? Ha ha, no. It really looks like a turtle. But why a turtle? That can’t be right. …Oh. Two turtle doves. Aha! As for the kitchen shears, @Steve, I use mine to cut pizza, flower stems, food packaging, cooked meat off of bone, fat off of raw meat, “slice” up food (like hot dogs) into bite size pieces, trim herbs, etc. I have a pair for food only, and a pair for non-food purposes. Sometimes it’s easier to use scissors than a knife and cutting board. My favorite – (and I didn’t know I needed it until I had it) – a cheese knife. Makes cutting anything sticky or slippery a breeze. Not only cheese, but great on tomatoes, fruit, pretty much anything. Just the right size and shape. In case you don’t know what I mean, here’s a picture. http://bit.ly/sjQGCS Don’t unitask it until you try it! I agree that kitchen tools are very personal so perhaps a gift card or at least a gift receipt so the recipient can exchange it if need be. I personally prefer one or two Henckels ranges over any other knife brand because of the weight and balance; I worked in a high end kitchen store a few years ago and we would spend a lot of time helping customers find the perfectly balanced knife. We also often came across the superstition regarding gifting knives; I’d say about 75% of knives we sold as gifts were wrapped with money attached to the box. For a vast majority, $315 dollars is a luxury and would not be seen to be inexpensive… There are many other cheaper options for people, like me, who aren’t in the 1%! @Paige — Most knife sets are $500 or more. A good knife set for less than that is inexpensive in comparison. Many of the knives on this list are less than $40 a piece. One (the boning knife) is under $17. The bread knife is the only one that is more than $100. Additionally, and this applies to all items we’ll feature on our lists over the next couple weeks, stay within whatever budget you have set for holiday spending. One of the points of an uncluttered life is to live within your means. Simply stated: spend less than you earn, and save some of what you earn for a rainy day. This year we’re focusing our lists on tangible things — but that doesn’t mean you have to give gifts of that kind. So, gift certificates are great — and it is particularly great if a number of friends throw in funds at the same store, so that one can get a nice assortment of needed things. I am not sure why it’s not on the list, but I have to give a shout out to Cutco knives. They ARE expensive, but they were a gradual gift over several years from my mom and I LOVE them. Plus, they have a lifetime guarantee. And, just to verify the guarantee … We lost our home in the wildfires of Bastrop TX over Labor Day. While surprising to many of you, my knife set did not make it out the door during our brief period of evacuation time. We found the knives in the rubble that was left, burned down to the metal shanks and rivets. Hoping that they would allow me to use the 1/2 price part of the guarantee (for abused knife sets) I sent them in with a letter of explanation. They replaced them ALL for FREE. I hope that none of you ever have to go through a disaster like we did, but if you do… I will love my Cutco all the more for this very reason. Plus, they’re made in AMERICA – another huge bonus to me. Sadly, the rest of my kitchen stuff was not made by Cutco, so we’ll be replacing it as we can and once we get back into a real house again. @clothespin — I’m a big fan of Cutco, but they are expensive in comparison to this knife set. We have their steak knives (which, I should add, were given to us as a gift and we are still very close to my husband’s grandmother — the knives did not sever our relationship with her) and we love them. We put them in the dishwasher, cut cardboard and rope and things we shouldn’t with them, and they’re in amazing shape a decade running. Their shears are wonderful, too. My mom has a pair. But, I think they’re two or three times more expensive than the ones listed here. I’m sorry to read about how you lost your home this summer. However, it is nice to read a positive customer service experience with Cutco. I like when companies do right by their customers. The problem with giving a knife or shears or anything else to someone you know likes to cook, is that they probably already have one! Of course the same applies to someone who likes to bicycle, travel, golf, sew, or any other hobby – odds are you will get them something they already have, or something they decided not to get for some reason. Anyways… I’m still not sold on the benefits of kitchen shears. I have regular scissors for opening packages, and a knife for cutting food. A $100 bread knife? Wow! Over the years I’ve accumulate about a dozen cooking knives and a steak set. Scissors are the most underrated kitchen implement there is. Scissors cut pizza, chickens, bags and packaging, chives, scallions, herbs, pastry dough, saran wrap, cheese cloth, and so many other things. I use $3 office scissors. Another good gift for an aspiring cook is a proper cutting board. Cooks Illustrated has reviews and comparisons of wood, plastic, and bamboo. Do NOT buy the hard clear plastic boards – they’re so hard they chip knife blades. And remember to include a gift receipt for whatever you get. What do you call the phenomenon where you go years without having a particular item on hand and then when you acquire it, you use it almost every day and wonder how you ever got along without it? Two items that fall into that category for me are a 16 oz measuring cup (for liquids) and a pair of tongs. I recently had my knives sharpened and learned that glass cutting boards are terrible for the blade, as are formica/laminate countertops (apparently the knife guy sees a lot of people using the piece that they cut out of new countertops for the sink as cutting boards). My mother bought my three sisters and me a 9cm Wüsthof Classic knife each for Christmas many years ago. My husband (main cook in our house) decided that he really liked it and bought a 12cm (different style) as well as the 20cm Classic. With that number of knives that have the same bevel angle for the cutting edge, I decided it was worth getting the Wüsthof ceramic sharpener. – saves going to a knife sharpener every time a blade needs a ‘trim’ and I know it’s going to sharpen at the manufacturer’s angle. I totally agree with @Laetitia and a few other people about sharpening knives. I have two steels for honing and my restaurant supply store sharpens for free while you wait. What are we to do with dulled knives otherwise? I don’t see that you can put them in the trash. If I give them to ‘goodwill’, am I not simply giving someone else a problem? I think I’ll let mine be sharpened down till they’re unusable.